“The place was magical, intimate and democratic.” This is how the Honourable Michael Kirby AC, former Justice of the High Court of Australia and patron of the Kirby Institute, described the Purple Onion, Sydney’s first gay bar. “If only we could reverse the time machine and go back to those nights,” he said. Located at 83 Anzac Parade in Kensington, only a few blocks from UNSW, the Purple Onion opened in 1962. Sexual activity between men was still illegal in Australia, carrying harsh punishments if convicted, and would not be decriminalised in NSW for another 22 years. The nightclub was a space where gay men could dance the night away or watch drag queens perform in relative safety from harassment and physical violence. The man behind that sanctuary-like space, and its cultural legacy, was David “Beatrice” Williams, an entrepreneur and drag artist who purchased the Purple Onion in 1965. Williams was born in London, but was evacuated to Ballarat, Victoria during World War II. He spent time in Melbourne as a university student in the 1950s and briefly owned a decorating business. He eventually moved to Sydney to work with Leslie Walford, a prominent interior designer. Williams took easily to the social life of Sydney’s ‘camp scene’ and was a fixture at the elaborate Paddington house parties of designer Neville Marsh. These parties featured parody fashion shows with men in drag. Complaints from neighbours, however, meant the burgeoning performers needed to find a new venue. They landed at the Purple Onion in Kensington. Williams made his first stage appearance in a production of Li’l Abner, which was based on a satirical American comic strip. He soon took over the club and began performing his own visionary cabaret shows under the stage name, Beatrice. 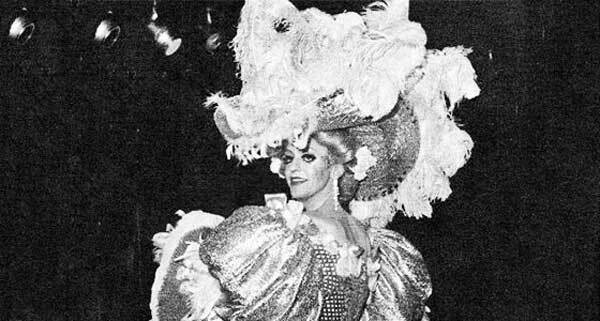 His first show, Hallelujah Beatrice, paved the way for a string of successful productions, which completely reimagined the drag shows of the late 1960s Sydney. Williams was an innovator: his lavish, complex production featured comic storylines, multiple characters and, of course, an array of elaborate costumes. Some of the most memorable shows included: How to be Beatrice, Mostly Beatrice, A Little of What You Fancy, Cinderella, and A Streetcar named Beatrice. There was even a satirical rendition of the opera Carmen, which Kirby saw performed at the Purple Onion in 1969. Australian theatre critic, Katharine Brisbane AM, heaped praise on the nightclub, calling it one of her “favourite... haunts” and describing its performances as “rare and authentic burlesque; shrewd, witty, obscene, and always up-to-date”. The club’s popularity soared with the city’s gay, lesbian and straight communities. Its famous ‘anything goes’ Sunday night parties attracted local and international celebrities, including entertainer Sammy Davis Jr. and singer Dusty Springfield. After the sad closure of the Purple Onion due to high rent, Williams moved to Europe and continued performing in satirical drag shows in London and Paris, including in a production called The Sound of Mucus. He eventually returned to Sydney, where he volunteered with the Community Support Network and the Positive Speakers Bureau, organisations that support people living with HIV and work to break down negative stereotypes about the disease. Williams passed away in 2014 at age 79. In his Will, he generously gifted nearly $2 million to UNSW to support HIV research at the globally renowned Kirby Institute. The Kirby Institute was established in 1986 in direct response to what was then an emerging HIV epidemic. Over the last three decades, among a wealth of incredible work in infectious diseases and immunity, it has played a vital role in antiretroviral drug development, and has helped transform HIV from a terminal diagnosis into a chronic but manageable condition. The Kirby Institute has also helped make HIV treatments more affordable and accessible for millions of people worldwide, and has expanded its remit to investigate and help control a range of other infectious diseases. The late Scientia Professor David Cooper AC, founding Director of the Kirby Institute who passed away in March this year, was passionate about building research capacity, and supporting future generations of researchers. It is therefore fitting that the first use of Williams’ generous gift will be for a postgraduate scholarship. At the donor’s request, the award will bear his stage name: “Beatrice from the Purple Onion”. “David Williams’s gift will enable the Kirby Institute to continue the important work that the late Professor Cooper so ably led: to find the best treatments, the best prevention strategies and ultimately a cure for HIV,” says Professor Tony Kelleher, newly appointed Director of the Kirby Institute and Head of the Kirby Institute’s Immunovirology and Pathogenesis Program. Professor Kelleher notes that the Kirby Institute has always worked extremely closely with the LGBTQI community in Sydney and nationally – especially the gay community, as HIV predominantly affects gay men. This ‘partnership approach’ has positioned the Kirby Institute, and Australia, as world leaders in HIV research. “In the relatively short space of 30 years since the epidemic first reached Australia, we are now in a position where not only has HIV been transformed into a chronic but manageable illness, but in addition new infections are finally starting to decrease and are at some of the lowest rates in the world,” he says. “David Williams was an icon of the LGBTQI community, and his extremely generous gift will ensure that his influence will continue to be felt by his community, and the wider Australian public, into the future. This story relied heavily on the reportage of Rosie Hancock for Heaps Gay, and the eulogy of David “Beatrice” Williams by John Wittes in his obituary for Beatrice, created for Sydney’s Pride History Group. This article originally appeared in the 2018 Donor Impact Magazine.